The pupils of Laurencekirk Primary School were treated to an Easter egg hunt with a twist – it was at Tullo & Twinshiels Wind Farms wildlife walk. Renewable energy developer Eneco UK, provided the children with bunny ears and a traditional Easter egg hunt. The children were given a talk about wind energy which is produced near to the school, highlighting the significance of green energy within the wider energy mix. The hunt, was also an opportunity to remind the children about the local wildlife walks while having fun hunting for eggs. One lucky pupil snapped up a family cinema ticket to be used during the Easter holidays. 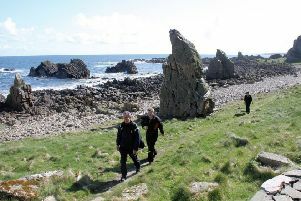 The wildlife walk opened in September 2014 following the inauguration of the wind farm’s extension, Twinshiels. A combination of trees have been planted since the opening to help attract more species to the area like; Alder, Bird Cherry, Blackthorn, Hazel, Oak and Silver Birch.